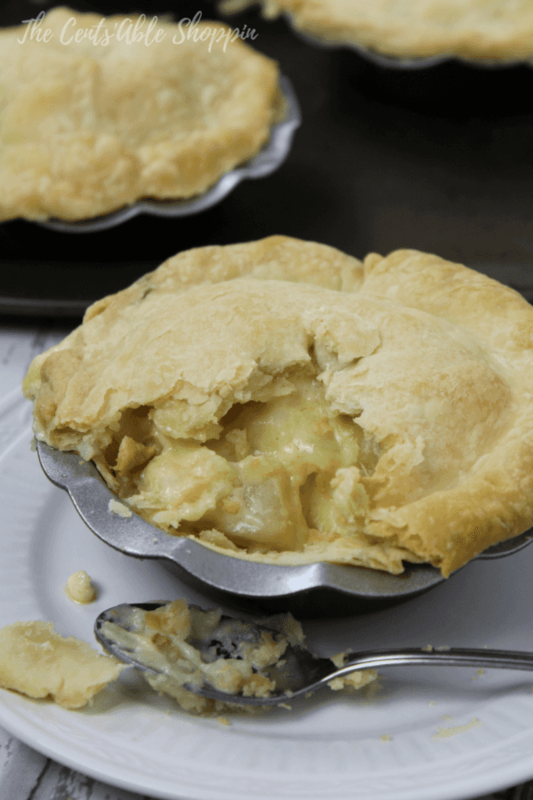 Chicken and Potato Pot Pie is probably one of the biggest comfort foods next to homemade macaroni & cheese. It’s amazing. Agree? Just a few months ago, a close family friend lost his wife of over 30 years to cancer – this man was someone who lived near to us when we were kids. As a fellow business owner, he got along well with my dad – who did a similar line of work. Fast forward 30 years, and this wonderful man lives here in Arizona – after choosing to sell his business and retire. It wasn’t just a few years after he had moved down here that his wife lost her battle – and now he is spending his retirement years alone. Just a few short weeks after his loss, I mentioned that I would love to stop in weekly and bring him meals – and share conversation.. just to help him through this challenging time. I felt that was the least I could do- after all, his kids were grown (and about my own age) and were back in Minnesota with families of their own. And I have been doing that now weekly since then. Every week I try to come up with some type of comfort food meal that I know he would love – make up several, and then wrap and deliver. I figured I can’t go wrong with pot pie – it’s delicious, and if made in individual tart pans, I can make several… each of which he can enjoy at his leisure. Of course, they tend to taste best right out of the oven but we can’t always make things perfect either. This recipe can be made into individual tart pans for separate pies; OR, you can use one glass baking dish and dig in casserole style – you choose what’s best for you. 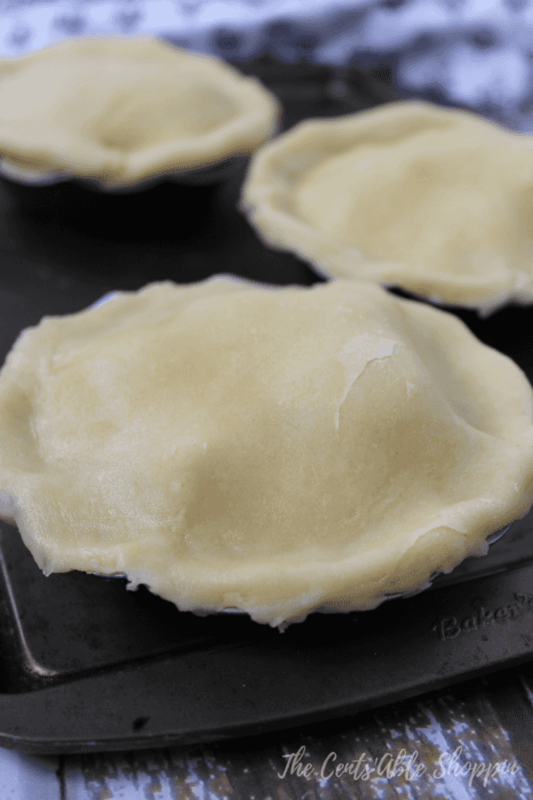 We picked up these tart pans from Gilt – and they are about 6″ in diameter – I haven’t ever seen any on Amazon similar but you could definitely use these 4″ tart pans and make the pies a little smaller – you would yield more than 5. I was able to roll the dough out thin enough to make 6 pies – kept one for myself and wrapped up the other 5 to transport to his home along with some grain-free chocolate chip cookies. 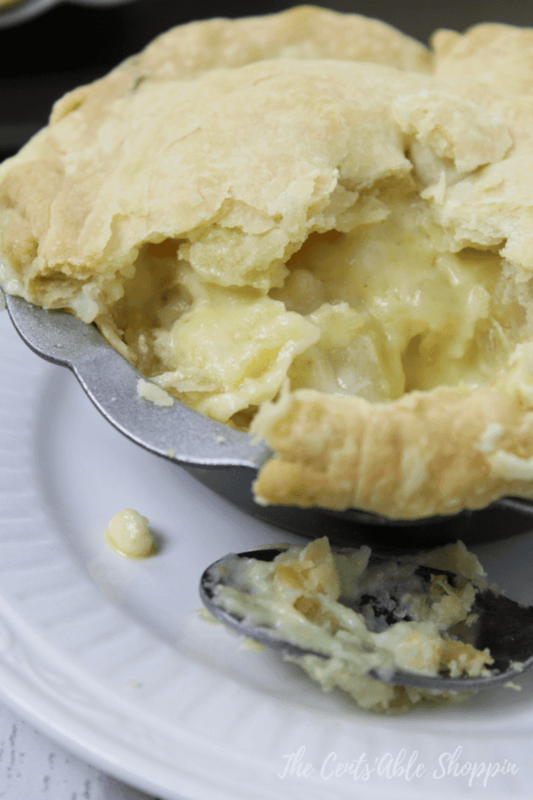 A delicious homemade chicken and potato pot pie with a homemade butter crust - comfort food at it's best! Preheat your oven to 350 degrees F. Line a large baking sheet (or, two medium sheets) with aluminum foil or your choice of baking mat and set aside). Slice your cold butter lengthwise down the middle, and then horizontally to make cubes - add that cold butter to the blender with 2 1/2 C. all purpose flour. With the mixer on medium, using the regular whisk attachment, combine until the butter cuts to make fine crumbs. Turn off the blender and add the ice cold water - turn the blender back on and mix just until combined. It should be a moist, pliable dough. Turn that dough out onto a generously floured surface - separate into 2. Roll one piece out at a time until it's 1/4" thick. I used a circular tupperware lid to cut circles from the dough, and lift into each tart pan - you want the dough to hang just over the edge of the pans. Wrap the other half of the dough well in plastic wrap and place in the refrigerator to use once you are done with the filling. Place the diced potatoes in a saucepan and top with water. Boil on medium for 15-20 minutes or until soft - drain and set aside. In a medium skillet, add butter and melt on low - carefully mix in the flour to make a thick roux. Gradually add the milk or half and half, stirring constantly to ensure that the mixture stays fluid without clumping. Continue to stir the mixture on low until it thickens - at that time add the bouillon and allow to blend with the mixture. Once blended, pour the drained potatoes into the skillet, along with the diced chicken. Stir to coat - determine if more liquid is needed (and if so, then gradually add a little at a time). Return to the fridge and pull out the dough you wrapped Unwrap, and roll out on a generously floured counter. Use the same dough cutter you did for the bottom of each tart pan and cut your circles. Let them lay there for a brief second - you want to pour the pot pie filling in each tart before you top with the upper crust layer. Returning to your skillet, spoon a generous helping of filling into each tart pan evenly - if you have filling left, top off each tart pan. Sprinkle a dash of salt on top of each tart, then top with each pie crust you previously rolled out. Crimp the edges, so that the upper crust at least folds over and is crimped to ensure that the filling won't leak out during cooking. With a sharp knife, cut an "X" on the top of each pot pie, and place into your oven for 20-25 minutes or until light brown. Allow them to cool slightly before eating - they will be very very hot! To freeze, allow them to cool completely and gently lift them out of the tart pan. Wrap them in plastic wrap thoroughly then place them in individual quart size freezer bags to preserve the freshness.